Although I'm a full fledged foundation junkie, I've never been a great fan of primers. 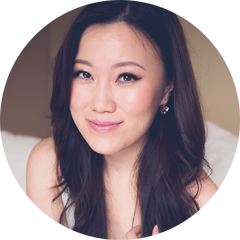 In the beauty community however, they are often cheered as the secret hero of the perfect base look, many swear by their faithful primers ranging from Smashbox to Chanel. In an attempt to discover what I had been missing, I do from time to time try to immerse myself in the world of primers but with little success. Usually it comes down to primers having too much silicone and although it does temporarily make skin feel smooth, my skin just can't handle it for long before breaking out crazily. 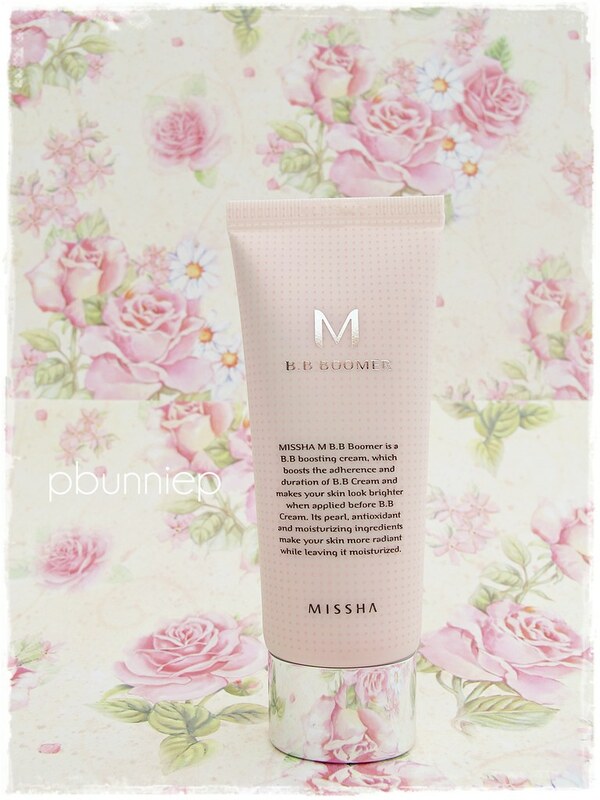 I happened upon this little primer by Missha as I was browsing for new Korean cosmetics (probably BB Creams again) and thought I'd give it a go since it looked to be more lotion like than most silicone versions. Besides, it was wildly popular and I had seen it numerously on various Asian blogs. 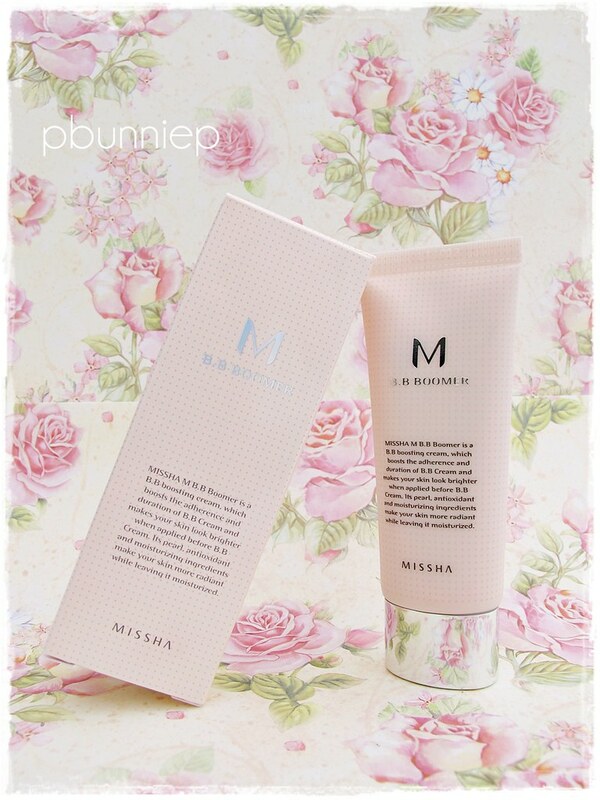 Availability: Missha online, ebay and other Asian product retailers. 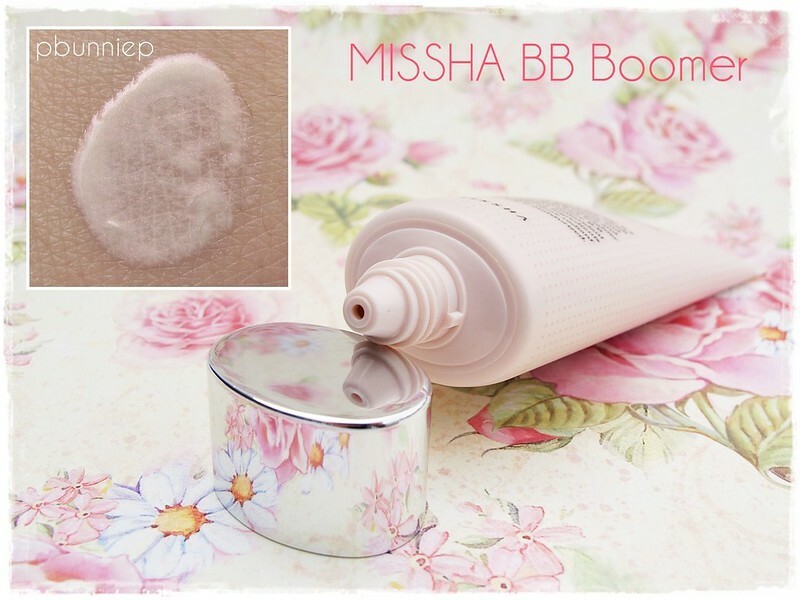 Missha's BB Boomer is marketed as primer for your BB Cream, meant to make your base last longer and sit smoother on the skin. (But why would you really need a primer if a BB Cream was meant to be multi-functional in the first place? Beats me.) The product comes out a pearly milky shade in a lotion like consistency. It contains a combination of light reflecting powders (coral and diamond) to provide luminosity to the skin, the primer is transparent once applied and imparts a very subtle sheen to the face without disrupting your natural colour so it would work equally well for all skin tones. Sadly however once foundation is applied over top, the majority of the sheen is covered up (that isn't to say you can't highlight with a little more product afterwards). The BB Boomer is very easy to spread and wears comfortably on the skin without making my face feel taunt or greasy, in fact because it's felt so natural on my skin I was really starting to think it wouldn't do much because it just seem to disappear into my skin and that was all. My skin did feel a little smoother but there was nothing impressive about that alone. My foundation applied over this just as it normally did, perhaps it blended a little easier and more evenly but again nothing that drew my attention so I thought little of it and went about my day. Little did I know that the magic of this primer was already at work, all through out the day as I went to check on my face, each time I was surprised at how great my base looked. My foundation never became patchy, didn't pool in my large pores over time (which tends to happen as the foundation breaks down) and even my problematic smile lines had little to no creasing. The primer did what it was supposed to do, making my base adhere better to my skin while protecting it. It acted as a barrier to separate my skin from my foundation which not only prevented the foundation from breaking down through out the day but also prevented my skin from becoming overly fatigued from wearing foundation all day.Whilst non of the skincare additives made any lasting improvement on my skin, I do feel that it kept my skin comfortable and calm so that when I took off my base after a 8-10hr day, my skin still looked pretty decent. 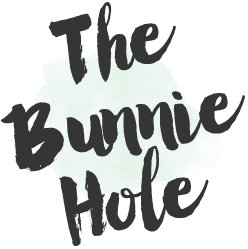 Affordable skin friendly primer to make your base makeup (foundation or bb cream) last longer. Skincare ingredients keeps skin comfortable through long hours, minimizing stress to the skin. Finely milled coral and diamond powder provides luminosity on bare skin. Light lotion consistency similar to Laura Mericer's primer rather than Smashbox's silicone versions. Did not cause breakouts, clogged pore or other adverse even with daily wear. Recommended for all skintypes except those with excessively oily skin (oil control may not be up to your needs), appears to be great for sensitive skin as well. Overall, I think the most remarkable thing about this BB Boomer primer is how unremarkable it appeared. I loved the fact that it didn't not alter the way my foundation applied on my face, nor did it change the consistency or look of my foundation. It didn't affect anything that I loved about my base products, all it did was make them last a little longer and sometimes that is simply what you need. I can see myself repurchasing this one for a long time to come. 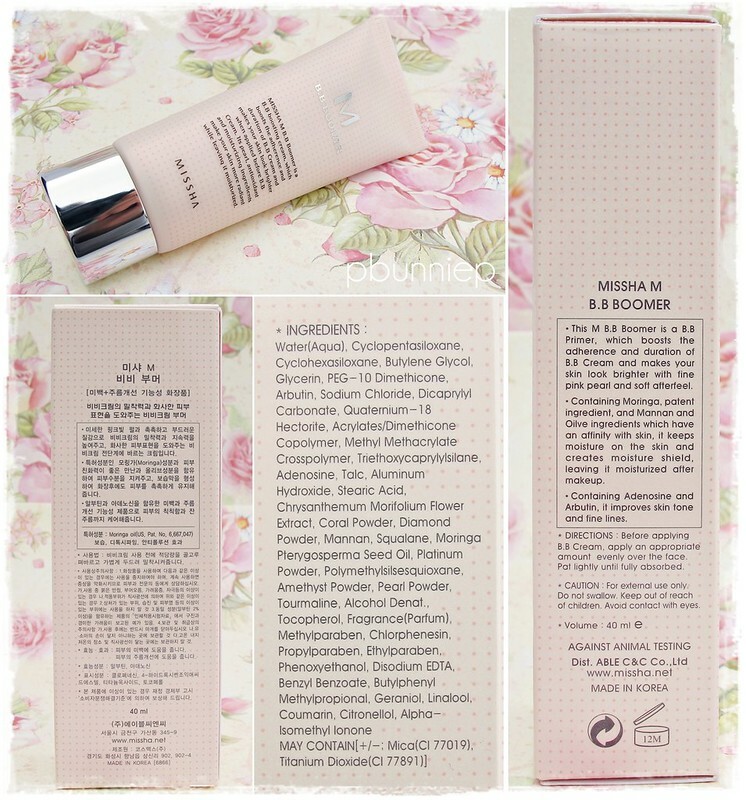 what would you say about comparing this to the etude house ampule primer? I'd say that the Etude primer is a bit more moisturizing and does feel like it has a bit more silicone in it. I'm switching out the Missha and taking out the Etude again for the winter. Will try to remember to do a separate review on it once I use it a bit. Just the packaging makes me want to buy it, feel so relaxing.